I just have to believe that any hope for an xMac is fading fast. While many Mac enthusiasts wish Apple were more like Dell, at least in product line offerings, Dell seems to be moving towards Apple. 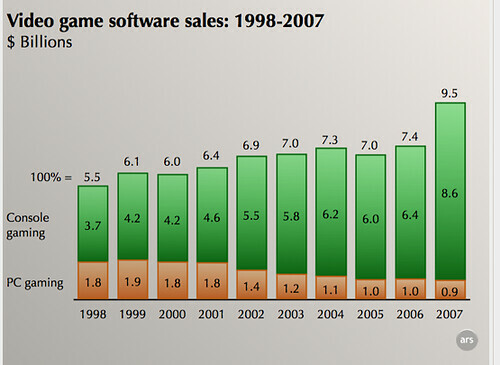 The graph showing the decline in pc gaming is quite striking IMO. Anyone hoping for Apple to make a machine designed for gaming, yes I'm thinking of you Joe the Dragon, should take a long hard look at the article. It ain't pretty. lol - when I saw the thread title I was immediately interested. Those who thought an xMac would be primarily for gaming have always been misguided. There are sound business reasons to want an affordable tower in the lineup, but gaming isn't one of them. being that M$ make up the main "PC gaming" OS, does this mean there is one less reason for windows existence? While many Mac enthusiasts wish Apple were more like Dell, at least in product line offerings, Dell seems to be moving towards Apple. That is a long reach you're making there. Dell has had a huge overlap between their XPS line and their Alienware division. Even when they first bought Alienware, people were wondering how it would fit next to XPS. And as has been mentioned elsewhere, given how extraordinarily well the XPS notebook line is selling, Dell would likely keep that line going. What is going on here would be the equivalent of Apple maintaining both the second generation "lamp" iMac and the current form factor for three years side-by-side, finally choosing to drop the lamp iMac because of a competitive need to tighten the product lines, and then some PC fanboy coming in and saying how this showed the market for AIO computers is "fading fast". Also, you seem to assume that anyone who wants an xMac wants a gaming Mac - absolutely not the case. Just as a lot of XPS machines are sold not to gamers but to people who simply want additional performance. That is a long reach you're making there. I will agree that its a reach. But with Dell offering an AIO and reducing their emphasis on gaming/enthusiast machines the reach is getting shorter. The dell AIO is lot easer to open up and it can use 2 hard disks in it. The Imac can not. It also has a built card reader and tv. Apple needs to drop the mini down 1 system $500 or less 2gb ram, DVDRW, and you can keep much like it is with more update hardware. Put a real mid-tower at the $600 to $2100 price range. Old g4 and g5 did not start at $2200 like the mac pro does. Imac dose not have a good screen and there all lot of g4 and g5 uses with good screens that do photo work but don't want to mac pro prices. also in business use AIO are not used that much and the mini is very weak next to other desktops at the same price and the other desktops are lot easer to open up and swap parts out of. Dell offering an AIO is the free market responding to a new niche. And until Dell explains what they are doing with Alienware (for all we know, they are going to invest into expanding the Alienware desktop line to absorb XPS sales and grow their high-end marketshare that way) and the enormously successful XPS notebook line (which wouldn't make sense being discontinued or being absorbed into Alienware), you have no basis for stating that they are reducing their emphasis on gaming/enthusiast machines. you have no basis for stating that they are reducing their emphasis on gaming/enthusiast machines. I think that chart says it all. PC gaming may not be dead but its bad sick. Are you really surprised they would cut back on gaming machines after looking at those numbers? Are you really surprised they would cut back on gaming machines after looking at those numbers? I don't disagree that the PC game market is on the decline right now. But the problem I am having with your argument is that you seem to argue because PC gaming is on the decline, therefore the whole market for performance PCs is on the decline. My argument is that there will always be a strong market for high-end enthusiast machines independent of games because not all enthusiasts are gamers. And, I'l cite the Ars article one more time... Dell is expanding Alienware's gaming offerings with lower-end (for Alienware anyway) rigs. It looks more like Dell is reorganizing their lineup. PC Gaming isn't as big or mainstream a market as it used to be, so they're moving their high-end gaming business to their boutique gaming brand and expanding those offerings. If the situation were as dire as you seem to make it out to be, why would they be expanding their Alienware lineup? People still hoping Apple gets into the Gaming World better also hope it's on a Console or it's never going to happen. Apple getting into Real-time Engineering Worlds and offering tools for companies to write Console games is about the most you can ever expect. The enthusiast market and the gaming market are tightly linked. The primary driver of faster and faster GPUs are games. The driver of high performance consumer machines is high performance in the graphics arena. So a 50% drop in gaming is likely a very significant drop in the numbers of high performance consumer machines purchased. High performance non-gaming rigs in the pro world tend to be workstations with quadro cards or multi-cpu high performance servers. The high end consumer tower presence is so-so from what I've seen. As far as Alienware, they never sold many units...Dell probably sold more XPS boxes in a month than Alienware did in a quarter. Consolidating under the Alienware brand makes sense given the brand has more cache and can commmand higher margins even on lower end machines that use to be XPS territory. Especially given that even a $459 Dell Inspiron 530 can be a decent gaming rig given a half decent GPU. The only limiting factor is that the low end dells tend to have wimpy PSUs. So normal machines can be pretty good at playing even demanding games at reduced settings. , so they're moving their high-end gaming business to their boutique gaming brand and expanding those offerings. If the situation were as dire as you seem to make it out to be, why would they be expanding their Alienware lineup? Alienware is like Vinea said, a boutique product. Expanding that line while eliminating the XPS line is still a net reduction in gaming rigs. And I would agree with Vinea that gaming is what drives the 'enthusiast' market in pcs. Especially now when most users only utilize a fraction of the power available on sub $1000 dual core machines. Agreed. And those same reasons hold for a consumer tower also. But you don't see how you're overgeneralizing the market, like backtomac is doing? Computers are moving towards becoming lifestyle machines. And high-end processing power and graphics power can and is used for more than gaming. People are making home movies, doing moderate to advanced photography work, working and mixing music. All this benefits from higher processing power, and with the video and photography work, graphical processing power as well. And this is the age of the prosumer - amateurs with a passion who are using professional level equipment and software to achieve their results. The press release was even clear that the only XPS machines being targeted were the XPS Gaming desktops, not the XPS Performance or XPS Notebook lines. Gamers and enthusiasts may have been tightly linked in the past but it's very much not the case anymore. It seems like Dell is planning on maintaining the size of the current XPS Gaming line and expanding the Alienware line - sounds like it's increasing it's investment in gaming and enthusiast machines, not the other way around. 1. I was the one who referred to Alienware as a boutique product. 2. Enthusiasts and Gamers have never made up "most users", just as Mac and Linux owners are not "most users". Using the argument of what "most users" want is going to fall flat here since we're talking about a group of users who by definition are not most users, they're power users, early adopters and setting the trends. But you don't see how you're overgeneralizing the market, like backtomac is doing? Computers are moving towards becoming lifestyle machines. And high-end processing power and graphics power can and is used for more than gaming. People are making home movies, doing moderate to advanced photography work, working and mixing music. All of which you can do on a Mac Mini or Macbook. Neither are particularly high performance machines. Both of which are lifestyle machines. All this benefits from higher processing power, and with the video and photography work, graphical processing power as well. Yes, but adequately served by mainstream processing power like C2D CPUs and mid-grade GPUs. Not Core 2 Extreme boxes with SLI. And this is the age of the prosumer - amateurs with a passion who are using professional level equipment and software to achieve their results. Mkay...show me that many prosumer lifestyle users (that don't game) buy C2E dual SLI rigs. The cost increment from a 2.8Ghz Q9550 to a 3.2Ghz QX9775 is nearly a grand by itself ignoring the GPU for the moment. Odds are they'd rather sink that grand in better PRIMARY gear...heck you can get a Canon EOS 450D or a Nikon D60 ($650) for the cost differential. Or pretty much move up from the Nikon D60 to a D300 ($1599) ...which is effectively a baby D3. No contest if the choice is between moving up to a D300 vs moving up to a top end C2E rig for post processing. Or even between getting more lenses vs moving up to a top end C2E rig. Likewise that $1000 difference between the top end C2D rig and the top end C2E rig can get you from a consumer grade HD camcorder to the entry level prosumer HD camcorder or from the entry level ($1900 SD Panasonic AG-DVX100) to the middle of the pack ($2800 Canon XH A1) prosumer model. However, for the gamer the C2E/SLI uber-rig IS the primary gear. Sinking a grand or two more into it results in direct increase in capability (running max rez with full settings) vs slightly faster postprocessing of video or photos. Even most gamers don't buy that crap. They buy a mid-range CPU like the E8400 and overclock it, then decent graphics card like the 8800GT with the thought of maybe adding a second one later. And that, folks, is an $800 computer. Gamers and enthusiasts may have been tightly linked in the past but it's very much not the case anymore. I disagree. Most enthusiasts are easily satisfied by todays dual core machines. Hell mainstream quad core is upon us. Enthusiast machines are nice words for gaming machines. Even Dell's link you provided alludes to this. At the end they(Dell) say they "love gamers". Not enthusiasts although for all intents and purposes they are one and the same. If Dell doesn't eliminate either the AW or XPS line they're making a mistake IMO. The trend of decreasing gaming on pcs didn't start 2 years ago. This is a decade long trend that doesn't show any signs of changing. Both you are vinea are arguing what is adequate and what satisfactory - and there's plenty that can fall into that category. But buyers, and not just performance buyers, have proven time and again that adequate and satisfactory just doesn't cut it - otherwise we'd all be running Mac mini Core Solos and Celeron Inspirons. I'm honestly baffled at both your reactions against performance machines. Is it because Apple doesn't have a price-competitive entry in the performance consumer space or something? Also, I'm not seeing where in the Dell blog you are reading that they equate gaming rigs with all performance machines. The blog entry I linked to was a direct rebuttal to the article stating that Dell is discontinuing their XPS Gaming series. The blog didn't address any other XPS line because the other XPS lines weren't part of the issue. And why would Dell want to eliminate either Alienware or XPS? Both lines are doing well (XPS Notebooks are doing especially well) and are making huge margins, as the high-end tends to do. The mistake would be to eliminate two of their bigger consumer line profit centers when the company as a whole is doing poorly.